If you said this bird was a large immature gull you're on the right track. The incoming gray on the back is too pale for any of the dark-backed gulls so out they go. Looking at the folded primaries, we can see that they are dark brown, not black, and have narrow pale fringes, both good marks for first and second cycle Thayer's Gulls. The gently rounded head and small, even-sided bill are also consistent with Thayer's Gull. 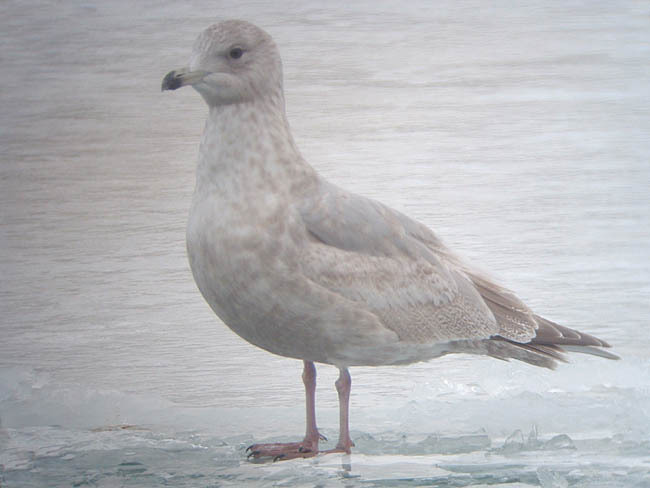 This second cycle Thayer's Gull was photographed on February 12, 2004 at Montrose Harbor in Chicago, Illinois.